Safely clearing land mines has been a challenge vexing militaries since shortly after the devices’ first widespread use in World War I. Methods to clear land mines have included heavy rollers or flailing chains positioned in front of vehicles and designed to detonate the mines without it damaging the vehicle. In the midst of World War II, the German firms Alkett, Krupp, and Daimler-Benz designed a new vehicle to detonate land mines and clear a path for men and machines to follow. 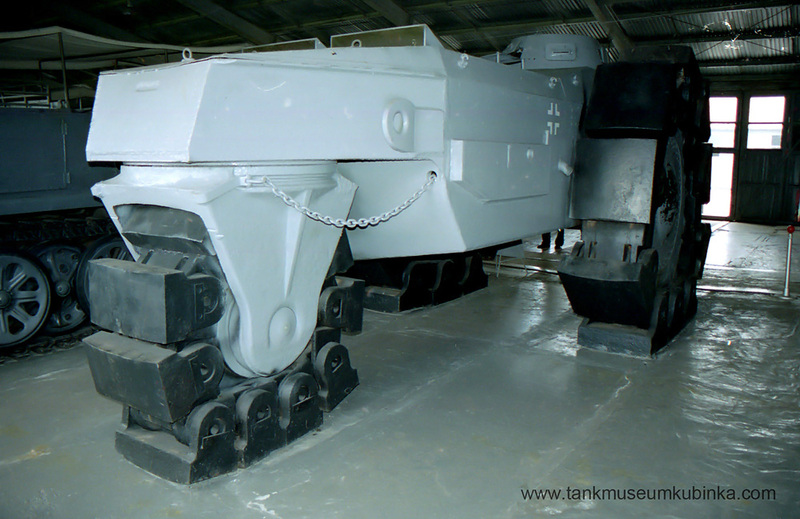 Built in the Alkett factory near Berlin, the VsKfz 617 Minenräumer was heavily armored and designed to detonate mines by simply rolling over them. (VsKfz is short for Versuchs Kraftfahrzeug, meaning “test vehicle.”) The three-wheeled vehicle’s wide track was designed to clear a mine-free path for other vehicles to safely travel. The sole prototype carried the Alkett chassis number of 9537 and was registered as NK-101. Unfortunately, much solid information on this vehicle has been lost to history. The Alkett VsKfz 617 had two large main power wheels at its front. A smaller, caster-style rear wheel was used for turning. Via power take offs and clutches, turning the steering wheel engaged worm shafts on both sides of the hull. The worm shafts operated in opposite directions—one side drew in a chain while the other slackened a separate chain. The chains extended through the VsKfz 617’s hull and were connected to each side of the rear wheel, rotating it as the driver turned the steering wheel. There is no indication that any differential steering was available. The rear wheel of the VsKfz 617 digging into the ground can be seen in this image. Note the large shoes of the main wheel. Each wheel was made up of 10 links and 10 thick, heavy, solid shoes. The pin that connected two links also attached a shoe. Three of the shoes would come together on the ground for each wheel. The total of nine shoes gave the VsKfz 617 ample ground contact. The thick shoes were also resistant to damage from mine blasts. Damaged individual shoes and links could be easily replaced. The VsKfz 617’s transmission was positioned in middle of the vehicle. A shaft led from each side of the transmission and engaged the gearing for the main wheels. A Maybach HL-120 V-12 engine was situated transversely behind the transmission. This gasoline engine produced 300 hp (224 kW) from its 4.13 in (105 mm) bore and 4.53 (115 mm) stroke cylinders. Its total displacement was 729 cu in (11.9 L). Two radiators were positioned behind the engine. Cooling air was brought in from ducts on the upper middle of the VsKfz 617 and expelled through vents on its upper rear. A 190 gallon (720 L) fuel tank was positioned above the rear wheel. 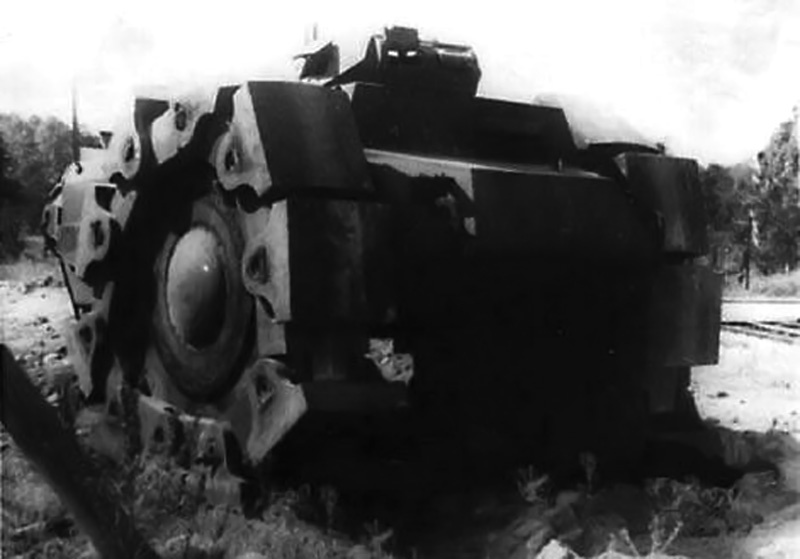 This poor quality image of the VsKfz 617 still conveys the vehicle’s rather imposing appearance. Only one machine gun is in the turret, which is how it was found by Russian forces. 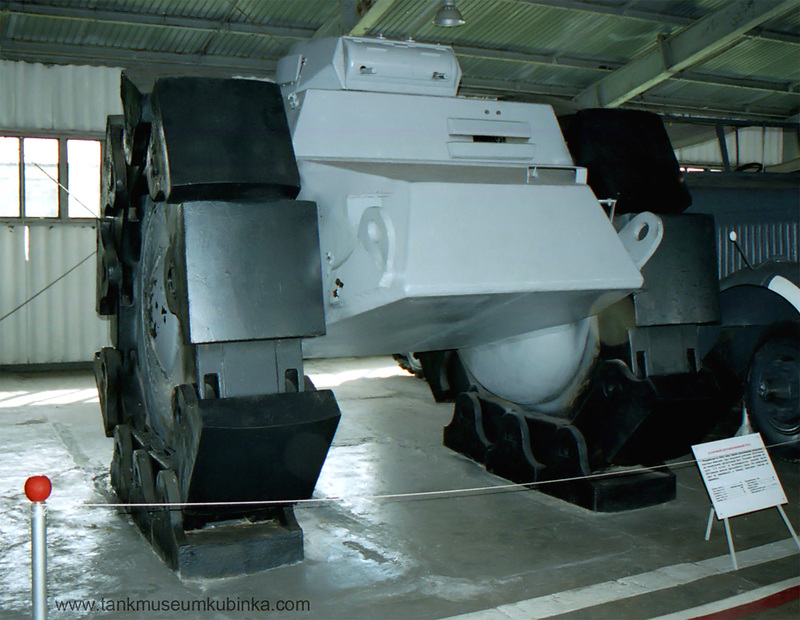 The VsKfz 617’s hull had about 39 in (1 m) of ground clearance that helped protect the crew from mine detonations. Furthermore, the bottom of the vehicle’s hull consisted of 1.58 in (40 mm) thick armor plating, with an additional 0.79 in (20 mm) of armor sheeting inside—creating a double hull. The rest of the vehicle’s hull thickness varied from 0.39 to 1.58 in (10 to 40 mm). 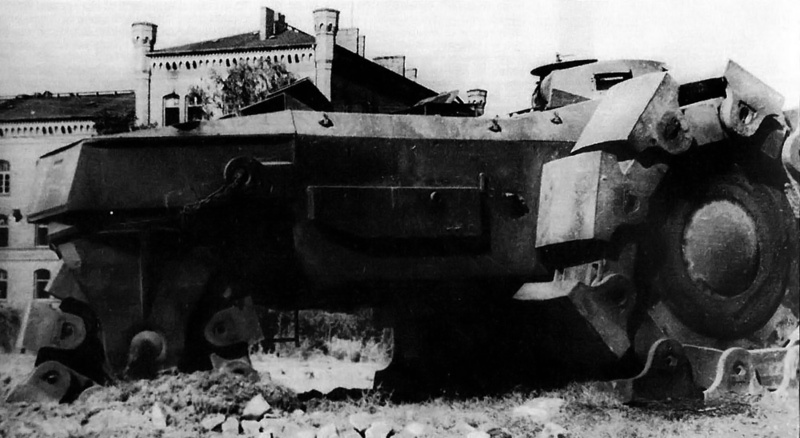 For defensive armament, the VsKfz 617 prototype had a Panzer I turret with two 7.92 mm MG 34 machine guns. However, the production version would have a Panzer II turret with a single 20 mm KwK 30 L/55 cannon and one MG 34 machine gun. The driver occupied the left side of the vehicle and saw out via a small slit in the upper armor. A rear wheel position indicator was just in front of the driver’s view. The vehicle’s commander was on the right, operating the turret. The VsKfz 617 was 20.6 ft (6.28 m) long, 10.6 ft (3.22 m) wide, and 9.5 ft (2.90 m) tall. It weighed 55 tons (50 tonne). This view of the VsKfz 617 displays its unique side profile. Testing of the VsKfz 617 started as soon as it was completed in 1942. It was quickly found that the VsKfz 617’s method for steering was unsatisfactory and that the vehicle was slow and hard to handle. 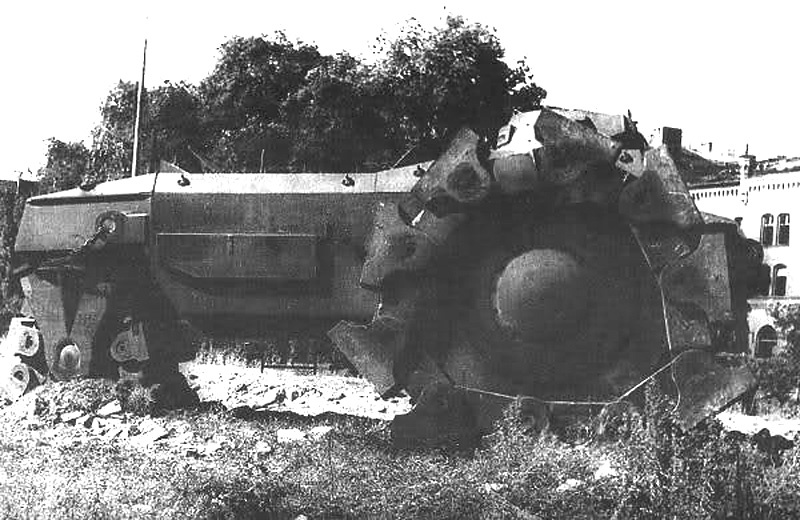 To make matters worse, its immense weight caused the vehicle to easily get bogged down. The VsKfz 617 and plans for its manufacture were abandoned after the tests. The sole VsKfz 617 was captured by the Russians in late World War II, possibly in April 1945. The vehicle was inspected and tested in Kubinka near Moscow in early 1947. The Russians came to the same conclusions as the Germans regarding the VsKfz 617’s use, also finding that its slow speed and lack of maneuverability would make it an easy target for artillery. The VsKfz 617 was preserved and is currently on display in the Kubinka Tank Museum. This entry was posted in Automotive on 24 August 2014 by William Pearce.